What do you do when your family outgrows your house, or when the quirks of the place you once found charming aren’t so charming anymore? 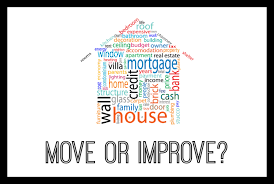 Is it smarter to move or improve? Here’s some advice to help you decide. Existing-home sales were at their highest levels since 2006, and the median home price hit $197,100 at the end of 2016. Right now, it’s taking just over two months, on average, for homes to sell. If you’ve been holding back on selling, waiting for the real estate market to recover, you may find it’s recovered in your area. As you prepare your home for sale, consider what homebuyers want right now. Hint: energy efficiency. Demonstrating that your home is weather-sealed is a great selling point. Also, if you’re only up for a minimum amount of work, focus on curb appeal (which REALTORS® say is critical to attracting buyer attention), your kitchen (even tweaks can make a big difference), and pricing your home right. The offers will come. Take a look at homes for sale in your market to get an idea of what you can get for your money today. Check your credit report to make sure it’s accurate and up-to-date. Fix mistakes you find in your credit report. Get prequalified for a mortgage so you know how much you can spend. Ask your REALTOR® to send you current listings from your target neighborhood. During the economic slump, home improvement spending slowed, so contractors were willing to cut deals to stay busy. Today, they’re less willing to bargain on price and too busy to accept low-profit jobs. As a general rule, improving your home costs less than trading up. But it depends on what kind of improvements you want to do. Now more than ever you need to make sure that you invest your money wisely. In other words, will your $75,000 kitchen remodel increase your home value by $75,000—or by anything close? Not likely. But at resale you may be able to recoup some of your remodeling costs. For guidelines, check out the Cost vs. Value Report, which gives the national average annual cost and payback figures for 35 popular remodeling projects. To assess what’s right for your particular house, let your neighborhood be your guide. If there’s any chance you’ll move within the next 10 years, keep your improvements in line with those of other houses on your block, or risk losing the money when you sell. Of course, don’t discount your enjoyment factor. If it’ll make you happy to install an in-ground pool in a neighborhood without pools, go for it. If you love the spot, improving makes sense. But if a different location would be an improvement in its own right, then trading up could be the way to go.